Back to normal? We normally don’t do gravel on Thursdays! After a “light” ride Sunday, then being off the bike completely for the next three days while in Reno for a trade show, I wasn’t sure how things were going to go this morning. And seeing two of the faster morning-ride guys at the start, George and JeffZ, didn’t exactly boost my confidence! But things worked out OK; younger Kevin went off the front with JeffZ, George and older Kevin (pilot) rode behind at a steady pace, and me, well, I hung for a while then watched George and Kevin (pilot) ride away, but slowly clawed my way back to them on the upper reaches of Kings. It was nice to have some real horsepower on the ride this morning; George and Jeff pulled hard down 84 towards West Old LaHonda, where things ground to a bit of a halt when we discovered they were doing some serious road work, laying down gravel & oil and I’m sure making a mess of the road for quite some time. So we retraced our way back up the hill a bit and then, at Kevin’s (pilot, the old guy) suggestion, rode up Williams Ranch Road, which intersects West Old LaHonda right at the end of the section they were working on. Things aren’t going to return to full-normal for a while yet; Sunday morning Kevin (not the pilot) and I have a gig in Foster City where we’ll be pumping up a lot of flat tires for a community bike ride, and afterward heading out for a pretty late ride, probably the usual, Pescadero/Tunitas. And in-between rides going a bit nuts because things are very busy at the shop and we’ve got extremely-thin staffing at the moment (if you know anybody who’d like to work in a great bike shop, let me know!). In fact, this Saturday we’ll have just a few of us in the shop on the busiest day of the week, as my brother Steve has a relative getting married and another employee injured her foot. By Sunday I’ll be needing a bike ride… desperately! Mike: I was on Stage Rd. today (Saturday Sept. 22). 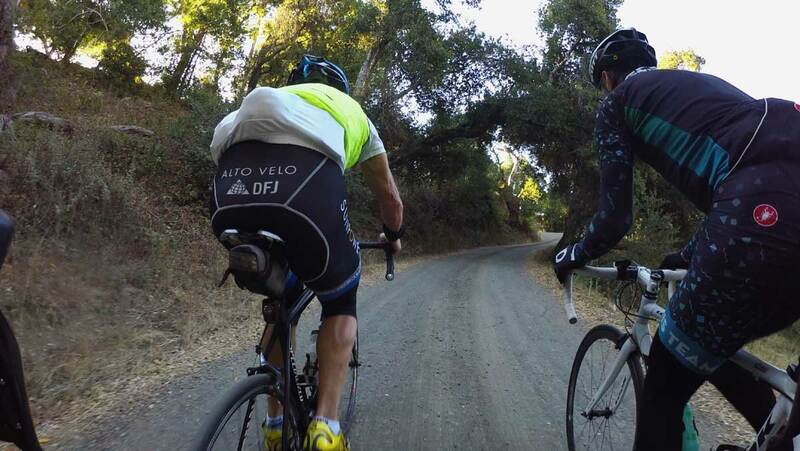 The only gravel portion is between Pomponio Rd (between climbs 1 and 2) and San Gregorio, and it was bad. Think lightly salted gravel on your pavement. Thanks for the info; we’ll do that “stage” of the ride via the coast then! Did you happen to ride Tunitas as well? I meant to say that it wasn’t bad.